I am so behind on making cards for challenges I like to participate in. Most of my free time is on the weekend and last week was jam packed and the upcoming weekend doesn't allow for any creativity either so I am definitely feeling the pressure. This image was a freebie from Deedee's Digis. I have a nephew that loves corgis and pugs so I will definitely be using this cutie again for his college graduation card. The patterned paper is by K & Company; the rest I pulled out of the scrap pile. The star is embossed so the card works for the current OWH ODBD challenge to make a card using embossing. 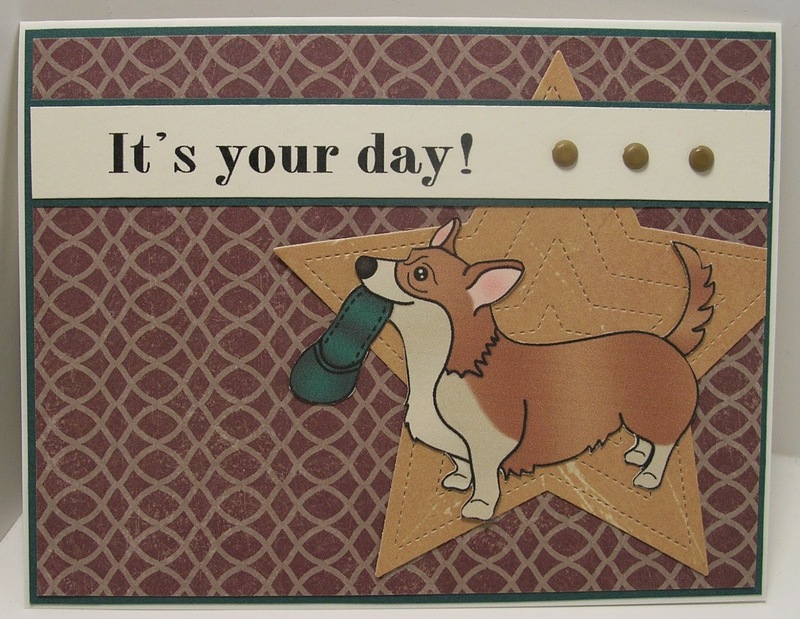 YOu did this corgi proud with your card! I love that dsp and how you put rover on a star :) Great card! Oh the graduation card would be cute...Deedee has a graduation hat digi I wonder if you could put that in his mouth instead of the slipper! If you make a graduation card please show us would love to see it! I like this one and how you have him on a star. I agree a very versatile card. Thanks for playing in the Digi of the Month Challenge at Deedee's Digis. Love that doggy!! Such a great card!